Interview with “KOREA-FANS”, biggest Kpop(Hallyu) community in Turkey. Everytime I think about Turkey, two things come to my mind immediately. One is the Korean War. Many Turkish soldiers fought and died in that war. We Koreans never forget it. The other one is the 2002 World Cup. Korea and Turkey met at the third-place match. Both countries shared a friendship through the match. Then, what about K-pop In Turkey? You know, the question is quite natural to me. Luckily sarangkpop had an opportunity to talk with the korea-fans, largest K-pop(hallyu, the Korean wave) community in Turkey. 1. Please introduce Korea-Fans.com briefly. Korea-Fans was established on Jan, 28th 2007 in Turkey by our administrator Kıday Baksı. We’re a place that fans of Korea can learn everything about Korea & Korean culture. Currently we have 36,000 members and this number is increasing daily. Our goal is to reach more people who love Korea and to make a name all over the world as a brand. Our members are usually Turks but members from other countries are increasing. 2. Why was Korea-Fans.com created? At first Korea-Fans is established as a drama forum. In 2006, Emperor of the Sea broadcasted on Turkey’s public broadcasting TRT. Our interest and curiosity about Korea was started then. We started to search everything about Korea and in the process of time, we become the largest and the most comprehensive Korea forum in Turkey. 3. Do you have regular meetings for your website members? If so, please explain. Yeah, we’re having monthly meetings with our members. We have arranged countless meetings until today. Thus, we made good friends that we can share our Korea love. 4. I got stuck on ‘Dongyul’ while reading your webpage. What does ‘Dongyul’ mean? Dong-Yul is an e-magazine under Korea-Fans that was established by three of the founders in 2009. Based in Turkey, it is a Korean friendship forum. In 2010, three groups were created for our magazine: Dong-Yul’s editors, publishers and reporters. It is still managed by them. 5. Korea-Fans.com seems to cover everything Korea, from Korean politics to K-pop. We appreciate that. What is the hardest thing about running the website? In the beginning, Korea-Fans had just a few members. Year after year, our member numbers increased and today it has more than 35,000 registered members. 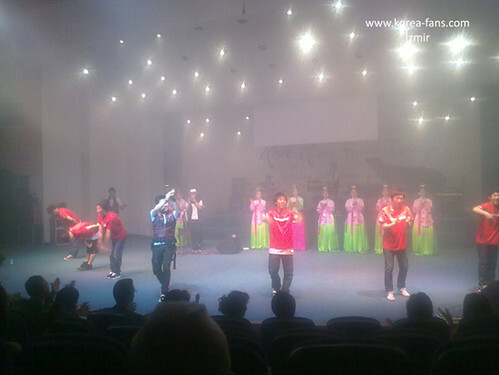 We have reached this success by productive sharings and eager Turkish netizens who want to learn about Korean culture. Korean dramas that have been aired on Turkish TV channels have especially provided awareness of Korea, Korean culture, and K-pop (through OSTs). Initially we have made mistakes or wrong policies. However, we have organized ourselves into 14 administrative levels such as: Administrator, Co-admin, Coordinator, Super Moderator, Master Translator, Translator, Amateur Translator, Korean Language Group, Dong-Yul’s Editor, Dong-Yul’s Publisher, Dong-Yul’s Reporter, Korea-Fans Designer, Korea-Fans City Representative and Korea-Fans News Agency. These administrative levels have an eye on their favorite sections. While running the website, we can face snide and malevolent users. If they don’t obey Korea-Fans forum rules, administrators ban the users properly. 6. Do you have connections with Korean companies or organizations like the Korean Embassy? We have had a connection with the Korean Embassy for three years. According as them, we arrange meetings and activities. In the midst of 2010, Korean ambassador Jae Hyun Bae invited to us his home for a special meal. The same year, a cultural center named Sejong Institute was opened in the capital of Turkey. Now, in 2011, there is a Korean Language Course in this place. Members of our family join the course and they can learn the Korean language. Moreover, Nanta is a famous performing group in Korea, you know. In December 2010 they came Turkey and they performed a great show. For this, we are thankful to the Korean Embassy. 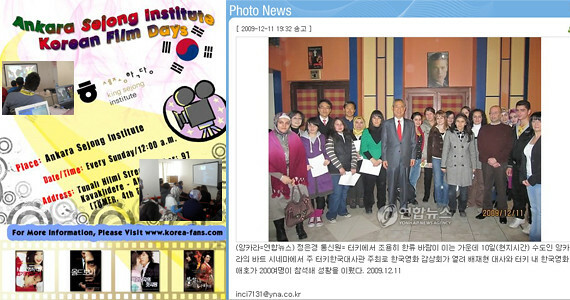 We also organize Korean Film Days in Sejong Institute. Every week our members and Korean Embassy members watch a K-movie together. 7. Do you have Korean members or visitors on your website? Yes. We have many Korean members who live in Turkey or Korea. We also have members from other countries such as America, United Kingdom, Indonesia, Malaysia, etc. 8. When was it that K-pop was first introduced to your country? I guess Turks first knew K-Pop in 2007. A Turkish channel was airing Emperor of the Sea. This drama was the first Korean show watched by us. The drama has a song called "You Went Away" sang by Kim Bum Soo. It was a slow and painful melody. We didn’t understand the lyrics of the song but we felt the sensation. However we liked this song so much and began to search on the Internet. So, later this song became phone ringtones. After 2007, the tv channel continued to air Korean dramas. Like as Goong, Goong S, Lee San, Great Seon Deok. And we began to learn new songs. These made us curious. Koreans express music truly and study on this matter very hard so the product is high-quality. As Korea-Fans, we began to introduce K-pop in our country. For 4 years, the new Turkish generation was able to know K-pop. 9. Briefly tell us about current K-pop in Turkey. 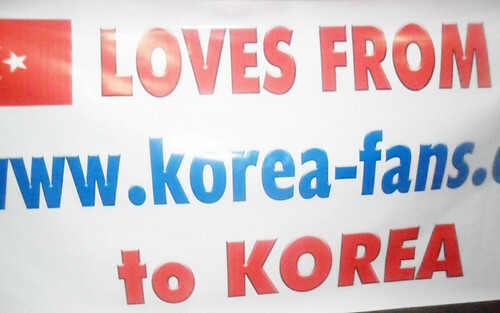 Firstly, we must say that Korea-Fans.com is a spearhead about it. We have news on our website at the same time as Korea! Netizens are following us! Secondly, Korean video clips are on Turkish TV channels sometimes and K-pop fans are waiting for these broadcasts curiously and excitedly. Also, there are so many amateur video clips which are dancing and singing by Turkish girls. We are waiting for K-pop stars here.Do not make us wait for a long time. 10. Which K-pop artists are popular? We love all K-pop artists but some of them have fan groups in forum. DBSK, Super Junior, SS501, 2PM, SNSD, T-ara and SHINee are the most favorite groups. BoA, Bi Rain, BoA, Se7en, Kim Bum Soo, Lee Hyori, K-Will are singers that we like so much. 11. Do you have a K-pop event on a nationwide scale? If so, tell us about it. Internet usage rate is increasing in Turkey and occupies a large place in daily life. The TV watching rate follows it. As we mentioned in above answers, Korean dramas introduce K-pop and ballad music to its viewers. K-pop is unfamiliar in Turkey. The main reason is the geographical distance between two countries. Thus Korea-Fans is the first place to find out everything about Korea including K-pop, singer and bands. The outcome of the closer relationship with the Korean Embassy in Turkey is the hope that they will invite K-pop stars to come to Turkey for concerts. We believe the Korean Embassy in Turkey attempts to make this necessary with concerned authorities. Besides this, followers of K-pop stars are organizing themselves and flooding e-mails to music TV channels and youth magazines. 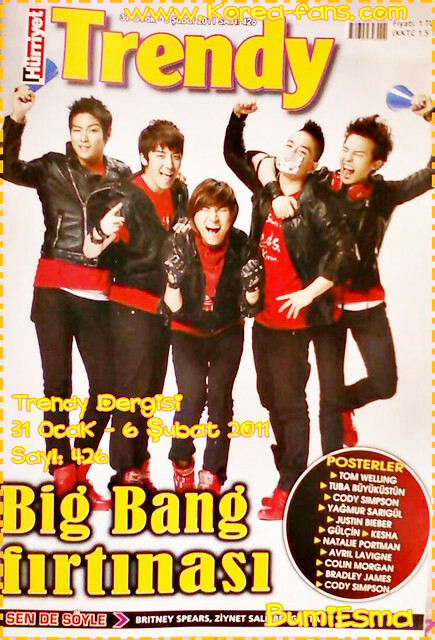 The channels broadcast K-pop music videos and the magazines publish K-pop stars’ posters. Turkey has great potential for K-pop. K-pop must be more familiar in Turkey! 12. What do you think are the differences between Turkish pop and K-pop? Anyway, we like K-pop so much and we want to see celebrities in Turkey. 13. How do you see the future of K-pop in your country? In Turkey, the K-pop wave has been spreading rapidly in recent years. Not long ago people could only access to K-pop via net. However, it is not a cyber fandom anymore. Until 2 years ago, any Turkish K-Pop lover couldn’t imagine that we could watch K-pop clips on Turkish channels, have K-pop groups’ posters in Turkish teen magazines, and be known by Korean singers that they also have "Turkish fans". We have achieved this. We can watch K-pop groups on TV and we can see their posters on our magazines. We, as Turkish fans who are full of interest and love for Korea, aim to bring the popular K-pop groups to Turkey. For once in a life time, we’d love to watch them live, to feel them and get signatures from them. For these wishes and dreams, we K-pop lovers work with a great enthusiasm and passion that increases as days go by. We believe that this love will grow much stronger and Hallyu wave will spread more in Turkey soon. 14. What about Korean dramas? Do you think there are many Turkish followers of K-dramas? Seeing the two countries’ dramas, what is similar and what is different? As you know, in Turkey there are many Korean fans and the main reason is Korean dramas. Lots of dramas have Turkish subs so we can watch and understand them. We have a team called ‘Korea-fans Subs Team’ and a website carries the same name. We’re really working hard to translate this subtitles from English into Turkish. Our people, especially teenagers, really like watching them cause Korean dramas are really different from others. Maybe more satisfying? There are not always happy endings and it shows reality. These dramas are not so long but Turkish dramas are really long! We don’t like it. It’s one of the big advantages of Korean dramas. We, Korea-Fans Subs Team, are following the current dramas and giving the priority to the most liked and translating them. Sometimes making surveys using our website http://www.korea-fans.com or Facebook. It helps me to choose dramas to translate. We’ll continue to translate Korean dramas. Please watch us. 15. Do you have a special event to promote cultural exchange between the Turkish people and the Korean community of your country? If so, let us know. Turks and Koreans have collective cultures. Family and consideration are most important to both cultures. The best way to learn a culture is living in it. Therefore, we want to invite you to Turkey.Our country has too many natural savings. We’ll put our guests up in our houses. In this way, Korean friends will have a chance to get acquainted with our culture. We learn about Korea and Korean culture K-dramas, movies and MVs. Some K-dramas aired on a Turkish TV channel. According to us there is not enough. So we want to sell K-dramas to Turkey for fair price. In this manner, we’ll see you often. We really love you! 16. How does the Turkish media respond to the Korean wave (Hallyu)? A Turkish channel named TRT released a K-drama. Turkish media met Hallyu with this drama. Then, K-Dramas were aried by Turkish channels. We have attempted many times via internet to be able to see Hallyu in our media. When they received the positive reaction, they continued to release video clips. Video clips of best known music bands in Korea such as DBSK, SUJU and SS501 were released by Turkish music channel named Number 1. After this, we wanted to see Korean celebrities that we love so much at press. As a weekly magazine, Trendy didn’t reject our request. Firstly they published the posters of famous actors and groups and now in addition to them, they gave place for Korea and Korea-fans. We aim to introduce Korea and its culture as many place as possible. 17. Many Koreans think that the Korean language is similar to your language but they don’t know how the two languages are similar. Can you explain how they are similar if you know Korean? Korean and Turkish are from same language family. Our sentences consist of subject, complement and predicate. It is the same sentence structure, I think. While we were learning Hangul, we recognized that Korean characters can articulate easily in Turkish. Even, English pronunciation in Korean is more difficult than Turkish pronunciation in Korean. Supplemental system in Korean isn’t complicated. Speaking in Korean, you use facial movement and unusual voices. These are common specialties in Turkish and Korean. Plus, some words are same. Like as Torun, Su, Anne,Çilek, insan, han. Many Korean courses opened in Turkey so many Turks joined in these courses. 18. Who’s the most popular singer in your country? 19. Can you tell us what Turkish people think about Korea? IIf you ask the Turkish community "What do you think of about Korea? ", the Korean War in 1950 first occurs in their mind. We have a lot of veterans and martyrs. I think the biggest warmth comes from here. Being respectful, taking heed of education, protecting history and still carrying on traditions are the most important characteristics that is identified with us. Today’s Korea has a modern and developed musical culture. Korean songs really do appeal to all age groups so that attracts our attention to Korea. Even if their food culture is somehow unfamiliar for us, we won’t make it a problem since they have such lovely personalities. Most of us have been knowing Korea through movies and songs. Seeing Koreans as determined and cheerful people has caused us to feel connected to them. In brief, we regard Korea as a brother country in all the way. 20. Anything to say to Korean netizens, say it here. We want Korean netizens to support and cherish us as Korea fans. We would like to be in contact with them and enjoy the Hallyu wave together. We also would like to see them in our country and host them in our homes. As being their sincere Turkish friends, we will always be with them. We sarangkpop really thank korea-fans and hope this interview can help promote cultural exchange between Korea and Turkey.